" Articles in Category: VelvetRevolution.us	"
Why Do Georgia Election Officials Insist on 100% Unverifiable Elections? "I worry that what we have here in Georgia is the Titanic Effect," Georgia Tech Computer Scientist Richard DeMillo observed, regarding the myriad security issues revealed during the course of last month's U.S. House Special Election in Georgia's 6th Congressional District. "Georgia officials are convinced the state's election system cannot be breached. Shades of the 'unsinkable ship'. They have neglected to give us life boats...a fail-safe system designed so that in case of a catastrophe Georgia voters can easily verify that reported vote totals match voter intent. It is the sort of common-sense approach that first-year engineering students learn. Other states have that capability. 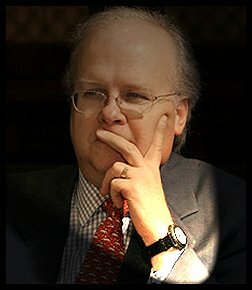 Inexplicably, Georgia does not," DeMillo said in a statement quoted in support of a legal challenge filed contesting the 100% unverifiable results of the June 20 contest. The computer scientist's concerns are hardly the first expressed about Georgia's absurd voting system. In fact, they cap well over a decade of chilling revelations, shocking vulnerabilities and dire warnings issued from the community of experts who have examined the Peach State's voting system, including a number of those who installed it in the first place back in 2002. 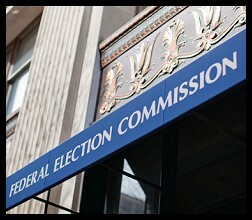 For election integrity advocates, the allegations set forth in the July 3 complaint (Curling II) --- filed by the Coalition for Good Governance and a multi-partisan (Republican, Democratic and Constitution Parties) group of electors --- should be enough to make their hair stand on end. That's especially true as it relates to official intransigence and even outright hostility towards computer scientists and researchers who revealed critical vulnerabilities within the state's 100% unverifiable and Orwellian-named Diebold "AccuVote" TS touch-screen voting and tabulation system. Curling I involved an earlier unsuccessful effort, filed just prior to the election, to secure a temporary restraining order that would have compelled Georgia to use paper ballots during what had become the most expensive U.S. House race in American history. With the exception of a relatively small number of verifiable paper absentee ballots, Georgia 6th Congressional District electors were forced to cast their votes into electronic black holes. The result: an "election" in which Republican Karen Handel reportedly defeated Democrat Jon Ossoff 51.9% to 48.1%, despite almost all pre-election polls predicting an Ossof win, with some surveys finding the Democrat with a 7 point lead over his Republican opponent. The touch-screen "victory" for Handel, the state's former Secretary of State, is now being contested in Curling II precisely because the reported results were produced by a wildly vulnerable and 100% unverifiable e-vote tabulation system. On Friday, one day after the U.S. Department of Justice (DoJ) filed a 43-page, four-count Criminal Indictment [PDF] against infamous, long-time West Virginia coal boss Donald L. Blankenship, U.S. District Court Judge Irene C. Berger issued a gag order in the case in an effort to secure a federal jury in West Virginia that could "be fair and impartial and whose verdict [will be] based only upon evidence presented during trial." That will be no easy feat. Blankenship, whom Rolling Stone described in 2010 as "the Dark Lord of Coal Country," is the former CEO and Chairman of the Board of Massey Energy Co. An extraordinarily rapacious capitalist, Blankenship is credited with transforming coal into an "aggressive, partisan industry" where the goal was to extract coal "as fast and as cheap as possible." Last week's federal indictment, however, relates to "the Dark Lord's" role in the massive April 5, 2010 explosion at the Massey-owned Upper Big Branch mine ("UBB") that resulted in the deaths of 29 Massey employees. It was the nation's worst mine disaster in the past 40 years. 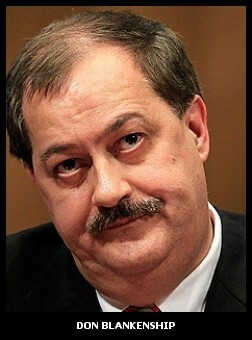 The indictment alleges that "Blankenship...conspired to commit and cause routine violations of mandatory federal mine safety standards," including "ventilation" regulations designed to prevent explosions, in order to maximize profits; that he "conspired to defraud the United States by impeding the federal Mine Safety and Health Administration ("MSHA") in carrying out its duties at UBB," and that Blankenship made "materially false statements...to the United States Securities and Exchange Commission" essentially to protect the value of Massey stock. The Politicus USA headline typified MSM coverage of what Brad Friedman often refers to as the "horse race" --- "Democrats Surge As Michelle Nunn Leads Georgia Senate Race In Third Straight Poll." 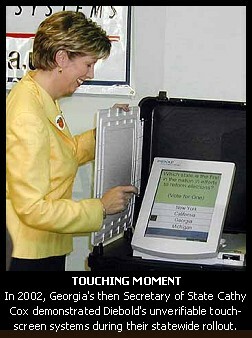 For The BRAD BLOG, and for a good many election integrity advocates and computer scientists, that narrow focus ignores "the track conditions," which, in Georgia entails the continued use of touchscreen voting systems courtesy of a 2009 determination by the Georgia Supreme Court that "unverifiable elections are just fine." So what do the Chinese Government and the Rightwing mega-lobbying group calling itself the U.S. Chamber of Commerce have in common? Apparently, they are both interested in hacking into the computer networks of their perceived political opponents and appear to be using very similar techniques and tools to do so, as The Nation's Lee Fang reported on Monday. A computer security expert cited by Fang notes "lots of overlap" between the recent documented Chinese military cyber hacks and tactics proposed for use by federal contractors working with the U.S. Chamber and their attorneys to discredit their enemies. Readers of The BRAD BLOG will likely remember the emails hacked by Anonymous in February of 2011 revealing that three U.S. government defense contractors had been working with U.S. Chamber of Commerce attorneys from the Washington D.C. lobbying/law firm of Hunton & Williams to develop a $12 million scheme to target their political opponents --- such as unions and progressive organizations --- by hacking into their computer networks, infiltrating the groups, planting false information in hopes of discrediting them, and using other sophisticated computer tools developed for the "War on Terror" by the three cyber-security firms. One of the perceived political opponents targeted by the Chamber, we would learn from the hacked emails, was I. Personal details about myself and my family showed up in both the emails and a PowerPoint presentation for the U.S. Chamber prepared by "Team Themis," the name used for the illicit project by the three government contractors, HBGary Federal, Palintir, and Berico. Lee Fang, who was then a reporter for Think Progress, and Scott Keyes, who still is, originally broke the revelations from the hacked HBGary Federal emails there. 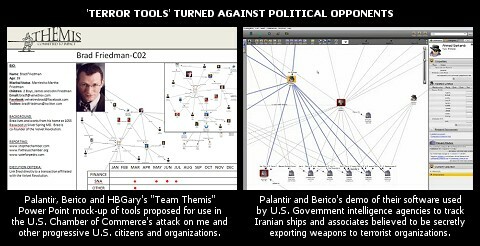 A slide in one of the presentations prepared for the U.S. Chamber scheme described the effort to "Discredit, Confuse, Shame, Combat, Infiltrate [and] Fracture" the progressive organizations with online tools, hacking and other dirty tricks in order to "mitigate [the] effect of adversarial groups." Another slide included a photograph of me, and other personal details meant to target VelvetRevolution.us, a not-for-profit good government group (co-founded by The BRAD BLOG) which has long called for accountability for the Chamber and its mafia-like political tactics. The news of the hack and its revelations quickly garnered front-page headlines in the U.S. and around the world as an international scandal, even as the Chamber denied having knowledge of the specific cyber-terror threat clearly being created on their behalf by the three defense contractors, and even as neither they nor their attorneys have yet to face any accountability for the scheme to terrorize public organizations and private individuals, such as myself and my family. An official Dept. of Justice investigation into the matter --- and even a brief attempt to do so by Democrats in Congress --- was no doubt crippled by both the enormous power of the Chamber, and the fact that it was the DoJ itself which had referred Bank of America to the very same defense contractors in a parallel scheme mirroring the Chamber's, as revealed by the same email hack. That scheme was being prepared to target perceived supporters of WikiLeaks at the time, including journalist Glenn Greenwald. "[W]ho better to develop a corporate information reconnaissance capability than companies that have been market leaders within the DoD and Intelligence Community," read one of the proposals [PDF] created by "Team Themis," as delivered to the U.S. Chamber of Commerce's law firm Hunton & Williams. In Monday's report at The Nation, Fang details how recent cyber attacks against U.S. interests, which appear to be emanating from the Chinese Military, mirror tactics used by the U.S. Chamber's thugs in the eventually aborted 2010/2011 attempt to pull off what Fang describes as "one of the most brazen political espionage efforts in recent memory." He had inappropriate sexual entanglements with a number of women and lied about it repeatedly to the American people. Yet nobody --- save for one Colorado law school prof --- seems to be calling for Justice Clarence Thomas' resignation for some reason. That, even though Thomas, unlike Rep. Anthony Weiner, appears to have actually, and flagrantly, and repeatedly, broken the law. 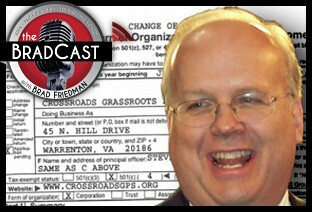 As we reported in January, Thomas appears to have "knowingly and willfully" filed falsified Financial Disclosure Forms which withheld disclosure of nearly $700,000 his wife received from the rightwing Heritage Foundation for the better part of the last 20 years. Only once it was pointed out publicly this year did Thomas bother to file "self-initiated amendments" to the forms he had signed just above the legal warning in bold and all caps which reads: "NOTE: ANY INDIVIDUAL WHO KNOWINGLY AND WILLFULLY FALSIFIES OR FAILS TO FILE THIS REPORT MAY BE SUBJECT TO CIVIL AND CRIMINAL SANCTIONS (5 U.S.C. app. § 104)"
While there has been little indication that law enforcement is actually investigating the crimes of the U.S. Supreme Court Justice (which, as we pointed out in January, are punishable by up to $50,000 and/or 1 year in jail for each instance of falsification), last Friday when Thomas' Financial Disclosure Form for 2010 [PDF] was released, the matter appears to have gotten shadier still, leading at least one government watchdog organization to describe what Thomas and his wife Virginia "Ginni" Thomas may be been doing as "Judicial Insider Trading." 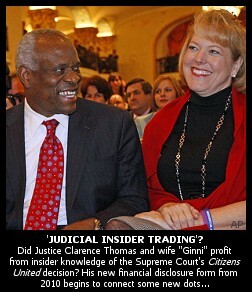 Connecting the dots, it would seem the couple made huge profits from Thomas' participation and insider knowledge of last year's Citizens United ruling at the U.S. Supreme Court, as we'll show you below. "When the ballot bags were taken out and placed upon the counting table, we were literally stunned," one of the citizen observers, Mary Magnuson, a Kloppenburg volunteer, told The BRAD BLOG this morning. 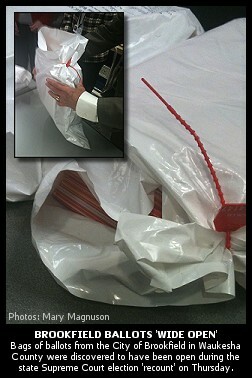 "5 out of the 6 ballot bags were almost literally wide open, and ballots could be clearly seen." The ballots in those bags were among the 14,000 said to have been cast in the April 5th election, but left off of Waukesha County's tally as reported to the media on Election Night. Earlier this week we offered a detailed report on the status of the statewide "recount," highlighting a host of disturbing and outright violations of the chain of custody of ballots, including unnumbered and renumbered ballots bags (many of them from Waukesha County); ballots discovered unsecured and/or left out of the original count all together; and exceedingly sloppy record-keeping and reporting of "recount" results by the state's chief election agency, the Wisconsin Government Accountability Board (G.A.B.). In sum, we described the state of the "recount" of the contested election between Republican incumbent Justice David Prosser and his independent challenger Asst. AG JoAnne Kloppenburg, as "a mess." Today, after the newest revelations from the Waukesha County counting room, it got a lot messier. In Friday's Daily Beast, University of Colorado law professor Paul Campos called for the removal of Justice Clarence Thomas from the U.S. Supreme Court bench, as based on 20 years of scofflaw, criminal behavior in withholding disclosure information on his wife Virginia "Ginni" Thomas' hundreds of thousands of dollars of income from Rightwing organizations which also happened to benefit from Thomas' votes on a number of SCOTUS opinions, including last year's infamous Citizens United decision. Several weeks ago, The BRAD BLOG was among the first to specifically detail Thomas' years of "knowing and willful" violations of the U.S. criminal code, even as the mainstream corporate media largely ignored or downplayed those violations of the Rule of Law in their limited coverage. In his column, Campos speaks to those crimes specifically, echoing our own analysis that they "certainly constitute a misdemeanor, and quite probably a felony, under federal law." The law professor gives voice to the same questions so many of us have been asking about all of this: "Why is it likely that no consequences will be visited on a Supreme Court justice who has committed a series of criminal offenses? Why is this story not a full-blown scandal? 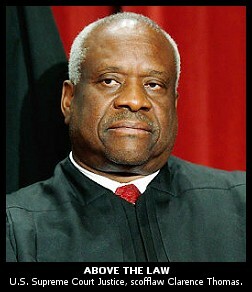 And why did Clarence Thomas do what he did?" On Thursday night, Comedy Central's Stephen Colbert waded into the HBGary muck with an explanation of the scam that the cyber-security intelligence firm, along with two other firms (government contractors all) were putting together for law firm Hunton & Williams on behalf of Bank of America, in hopes of discrediting journalists and organizations that supported WikiLeaks. 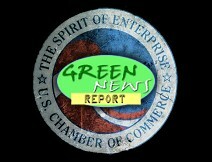 As readers of The BRAD BLOG likely know by now, a parallel $12 million scheme was being hatched by the same law firm and same three cyber-security firms on behalf of the U.S. Chamber of Commerce, targeting me and my family, as well as other citizens and progressive organizations the U.S. Chamber had regarded as their enemies. By the way, though I didn't notice it while watching a Tivo'd verison of the interview above on Thursday night --- so don't know if it was in the actual broadcast, or just added online, by someone --- PC Magazine noticed a curious anomaly at the 3:22 mark of the above video. 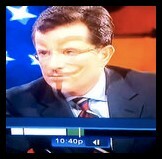 For no more than a moment, the infamous Guy Fawkes mask from V for Vendetta, often used as a sort of trademark by the "hacktivist" collective Anonymous (the group which inadvertently exposed both of the above described plots when they broke into HBGary's corporate servers and stole the emails describing all of this) is briefly superimposed over Colbert's face, for reasons unknown --- but amusing. Sad to say the best video coverage so far (though that's not saying much as I noted Friday night), of the U.S. Chamber of Commerce plot to dishonestly, and perhaps illegally, try and discredit, smear and illicitly undermine their perceived political enemies (such as me and, for some reason, my family) comes from HNN. That's right, from the Hacker News Network.